In September I welcomed new students into my Sunday School class who had moved up from the Pre-K/Kindergarten class into my middle grades class of 1st through 3rd graders. Because it is the start of a new school year, I decided to start at the beginning of the Bible and spend September focusing on the book of Genesis. 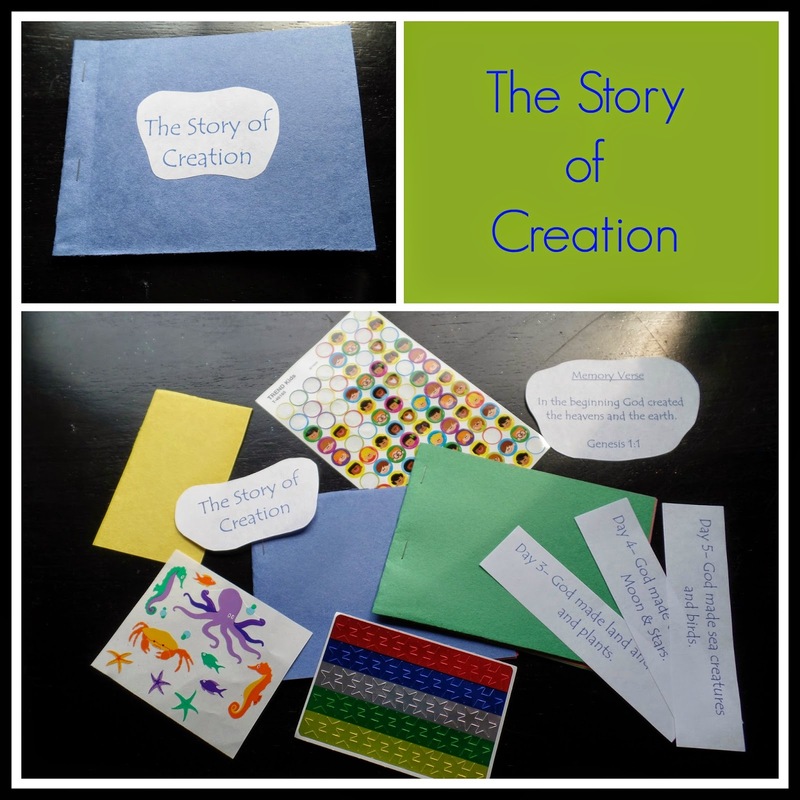 Our first lesson this month was the story of creation, found in Genesis Chapter 1 and Genesis Chapter 2:1-3. I had a lot of fun preparing for this lesson. Here's what our lesson involved. 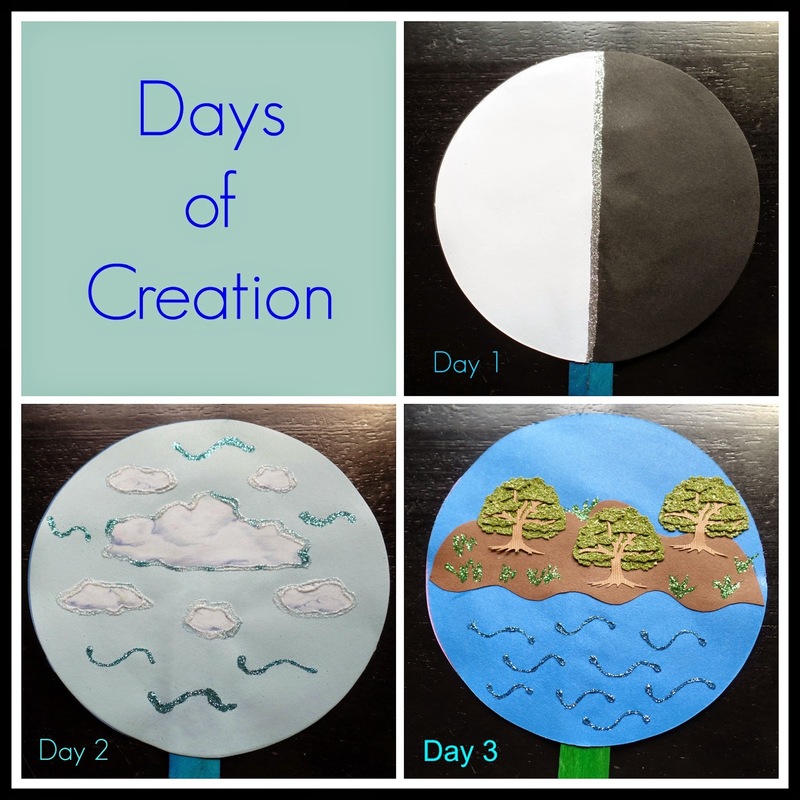 Awhile back I found a pack of pre-cut cardstock circle shaped paper and I knew I wanted to use it to craft something for the creation story. I got out my glitter, and my large collection of stickers and got to work making a set of creation story sequence cards. 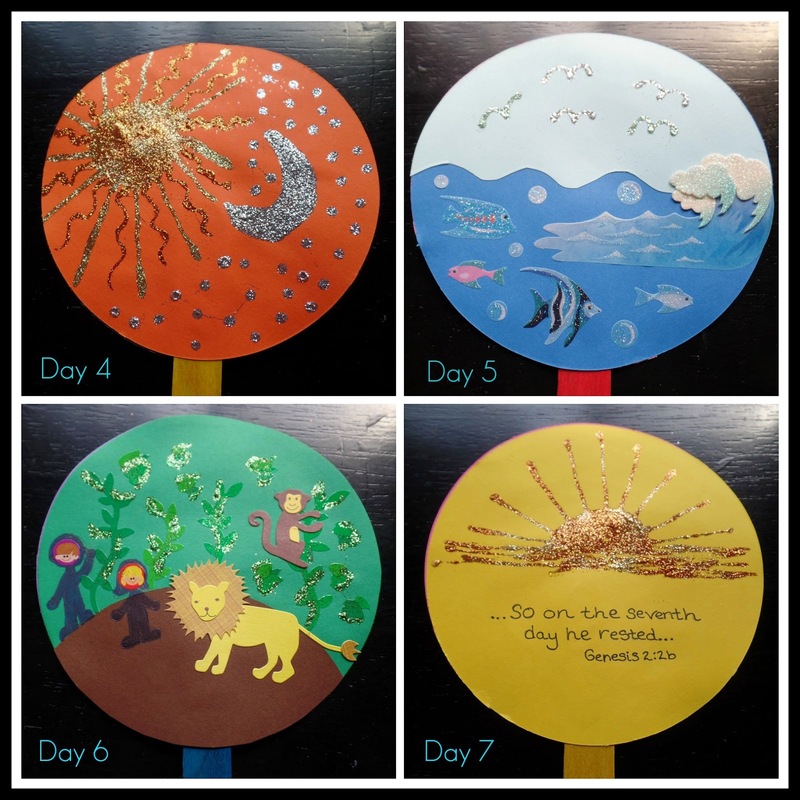 I used two cardstock circles for each day's card, and using craft glue, glued a craft stick in between the two pieces. I decorated each day's card with a picture representing what God created on each day, and on the back of each card I wrote the corresponding day in silver sharpie. If you can't find pre-cut circles you could just trace out a circle onto cardstock and cut it out, but I will say the pre-cut version was very handy if you can find it. I used various stickers, lots of fine glitter, and extra cardstock to craft each picture. Here are close ups of each day. My students really enjoyed these cards, I used them during story time, I read the story right out of an NIV Bible, and held up each card as I read the day. 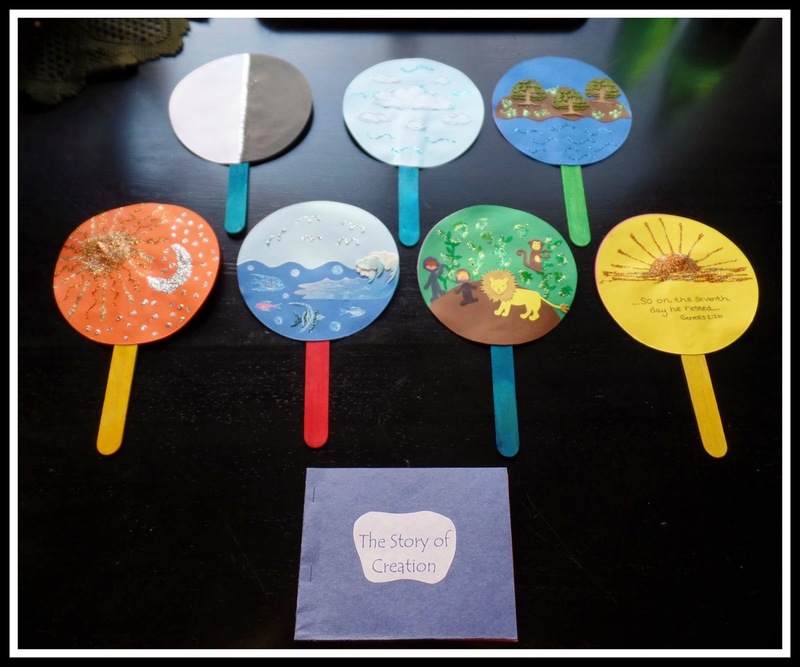 After I read the story I used the cards to help prompt the students to learn each day and the order of the creation story, then I set the sequence cards out on the table for reference during the rest of our lesson. For craft time I put together a simple mini book craft. I used construction paper to make the books, I made them on the smaller size about 1/4 of the size of a sheet construction paper, by folding four sheets of construction paper in half, then stapling in four spots and cutting that book in half. I printed out the title, as well as a short description of each day's creation for each page, and our memory verse. For each day I provided a mixture of construction paper, stickers that corresponded, and markers. 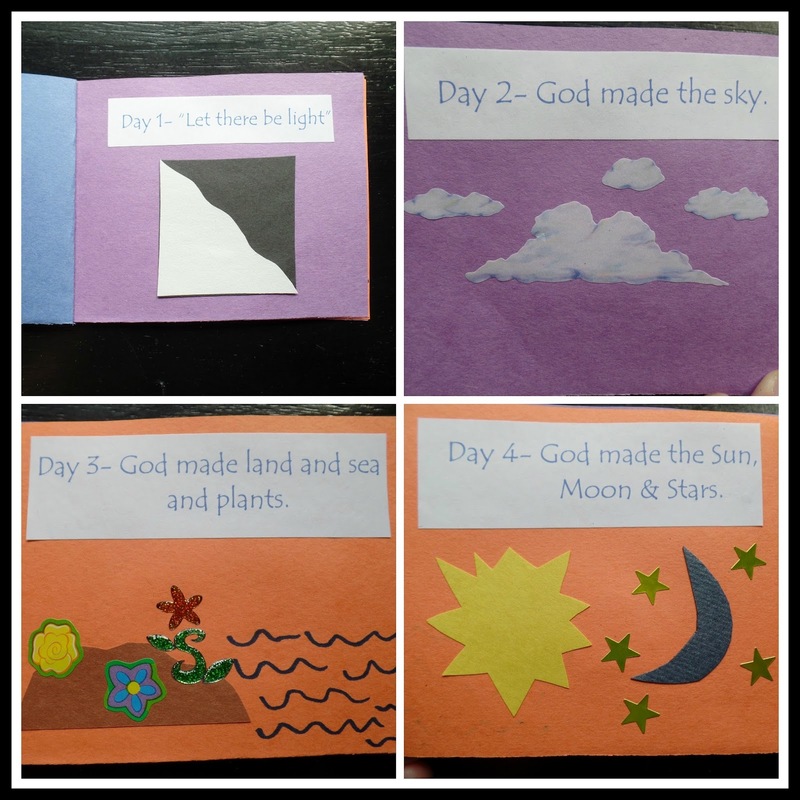 I made a very simple example of each page and then passed out supplies one page at a time and let the children be as creative as they wanted to. 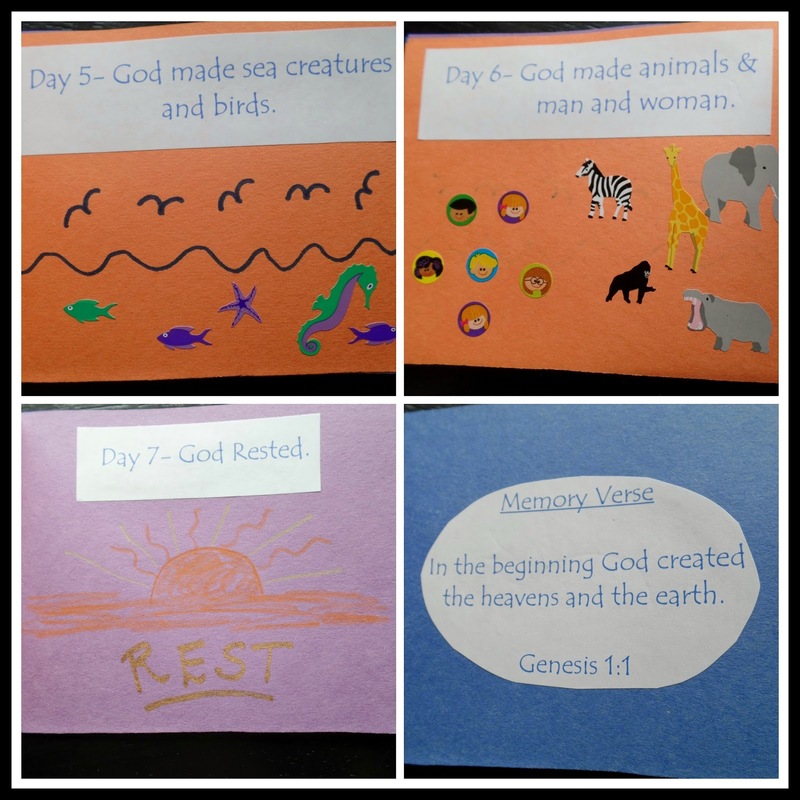 The homework was to learn their memory verse for the next Sunday, Genesis 1:1 In the beginning God created the heavens and the earth. As well as to share their little creation story book with their family. I have been using small prizes as incentives for learning verses lately, for this verse I found cute little globe key chains. The was a fun lesson to teach and I really enjoyed making the story sequence cards which I have saved to use again next time I teach this lesson. 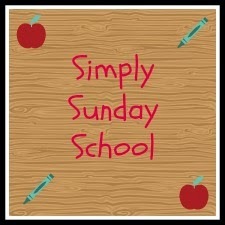 Check out more of my Sunday School ideas on my Simply Sunday School Page. Thanks so much for sharing at my party...it's always nice to see sunday school artwork from little ones. My hubs and I taught 4 year olds for years...but we retired from it a few years ago. This a great craft, April! I love the ideas of the little books to help teach God's word. That is great! I really like the sequence cards! They can be used for science too, like the transitions of the moon, or from day to night, and other sciency things. Great idea, April! A great idea, and it echoes the days of the illuminated paintings of the great cathedrals of Mediaeval Europe, where the Bible was taught through the paintings before the days of readily available printed books and ability to read. What a great lesson! Your sequence cards remind me of a new curriculum we are going to start using this year at my church. Thank you for sharing at Sharing Saturday! !